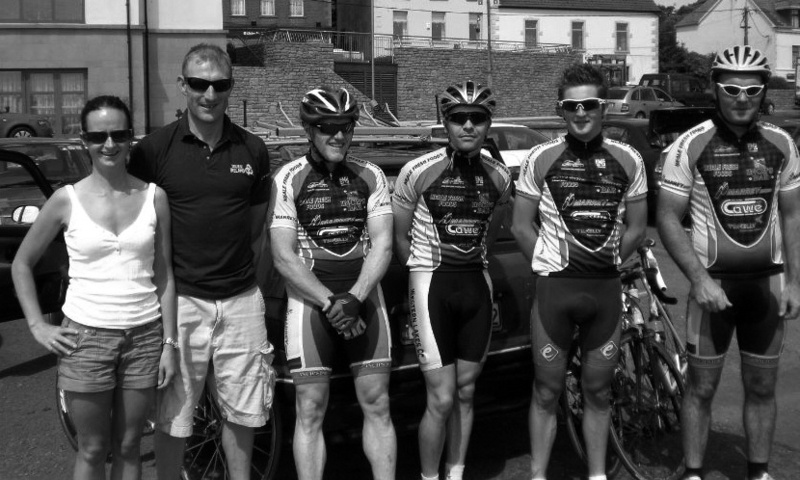 The Western Lakes Cycling Club was founded in 1999 by a small group of cyclists who had been friends for a long time and for one reason or another were unhappy with the state of affairs within their respective clubs. John O’Halloran was one of the founder members, and if I hadn’t known him I would most likely have joined one of the Galway city clubs. With the advent of the new millennium, I wanted to climb higher within the cycling experience, and joining the Western Lakes Cycling Club was the only sensible and logical way forward in this regard. I took out a full Senior Two licence for racing all over Ireland at a cost of eighty euro and bought some new gear in Kearneys in Galway. I also acquired some club gear but the acquisition that really stands out in my mind from that time was a thermal training top given to me by John O’Halloran. He had picked it up in Italy and it was brilliant for dealing with the wind chill factor. I also upgraded my bike courtesy of Dave Nugent. Then in February 2000, myself and John decided to enhance our preseason training schedule by participating in a number of Connacht League races. Brian Dowling, Dublin(Guest Rider); Joe Marrey (Ballinrobe). Photo courtesy of John James Flaherty. Our first outing was in Tuam and on our last training spin prior to the race John had really struggled all the way from Roundstone to Clifden on the run in. I felt really strong in contrast and couldn’t wait for Sunday. However, what unfolded that day was an initiation that I could never have envisaged, a new threshold of pain that I wasn’t physically or mentally equipped to deal with. I thought my heart was going to explode and that my legs were going to fall off with all the pressure. By the half way mark, I was well off the pace, dropped ruthlessly by the main bunch and consigned to solitary isolation for the duration of the race. It took every last ounce of energy, pride and determination simply to finish. I was battered, bruised, dejected and humiliated but not so my club mate. He had stayed with the bunch all the way through securing a highly creditable top ten finish in the process. I was flabbergasted in the aftermath of it all. I couldn’t get my head around how he could do it after struggling to keep pace with myself out in West Connemara just a few days earlier. Obviously he had used all his vast experience to hang in while I fell away, probably because I believed I couldn’t push myself any harder. John explained it to me later. “Professionals call it “the steel in your legs’’, he declared.’’ “You mightn’t be that fit but you know that if you dig in for a while longer it will get better and ultimately it does”. Throughout the remainder of the league, John continued to coax and cajole me into higher levels of efficiency and economy within the cycling experience. He was full of little tips e.g. what gear to go into approaching a hill, how to hold a wheel while braking and cornering and so on. He was effectively my first cycling coach whether he knew it or not, he played a massive part in my evolution as a cyclist at that time. Those competitive races in the Connacht League constituted a huge step up from our thrice weekly training spins. While out on the latter, myself and John could achieve speeds in the region of twenty three miles per hour but when you get forty bikes whizzing along in the peleton they’d get up to thirty miles per hour in no time at all. The peleton itself was an experience to behold, sometimes social, sometimes hostile but always interesting and challenging. High levels of concentration and vigilance are paramount because there are so many riders jostling and vying for advantageous attacking positions. Bad bike handlers who don’t give a damn about their own or anybody else’s personal safety are to be avoided at all costs. Their recklessness often leads to chaos and mayhem not to mention injury and harm. There’s generally a number of different dramas being played out simultaneously and it can be so draining mentally to keep up with them all. The challenge is, to be continually and constantly able to identify the potential break and to be ready and prepared to react accordingly. It was in this regard that I served a really tough apprenticeship early on in the sense that I was unable to hang in to the finish and was invariably having to settle for solitary finishes of anything from five to ten minutes down on the main bunch. I soon came to realise that success in the short term constituted finishing in the main bunch and this became my first major goal in competitive racing.